Norron AB was founded in 2010. The company currently has 14 employees, of which eight are Asset Managers. Norron is owned by Aker ASA (51%) and the remaining 49% is owned by the staff. Norron’s Asset Managers have a significant share of personal financial means directly or indirectly invested in the company’s funds. Valuation and administration are separate from management. 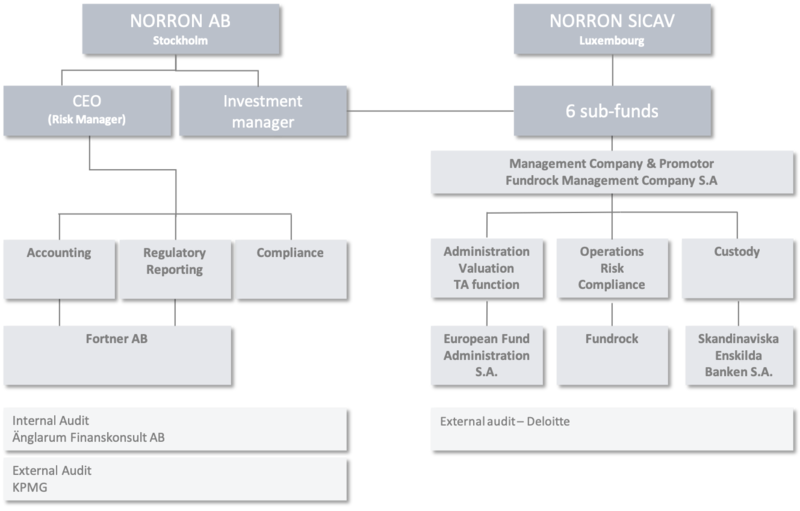 To ensure quality and independence, Norron has separated portfolio management from the valuation and administration of the funds which are under administration of SEB Fund Services in Luxembourg. SEB is the official fund company while Norron Asset Management AB is a securities company and Asset Manager.